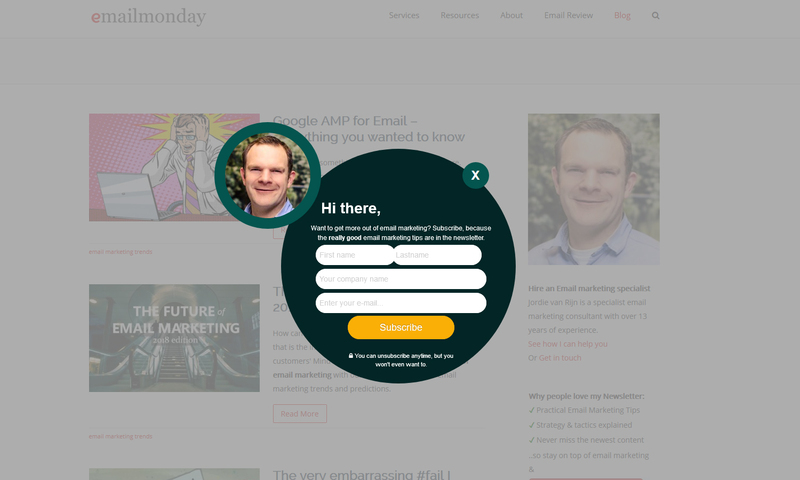 Call them whatever you like: email pop-ups, email capture pop-ups or opt-in pop-up forms. 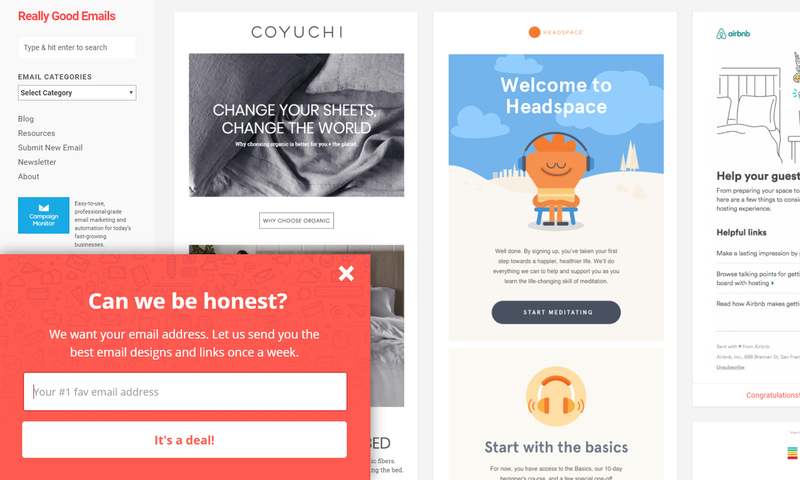 But as their format has no limit, creating your first email pop-up can be a little daunting. That’s why we gathered these 36 pop-ups. Taken from the most respected brands, they will help you overcome your writer’s block. We don’t have a minute to lose; let’s go! 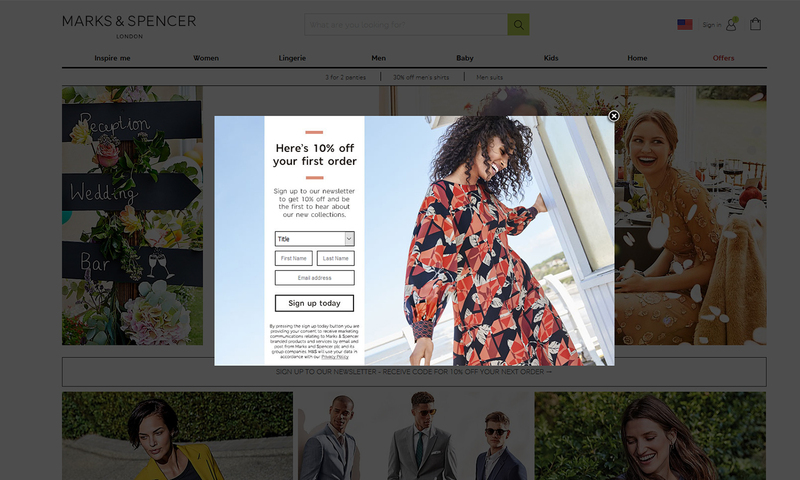 Let’s start with pop-ups displayed by online retailers. This lightbox pop-up catches visitors as soon as they land on Varley. Its design might look simple but it’s highly original: 100% black and white. 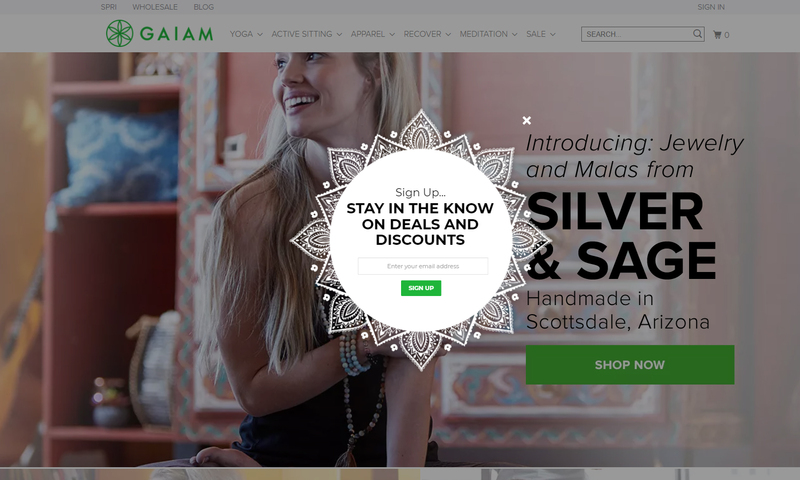 The 15% off coupon should convince even the most reluctant users. 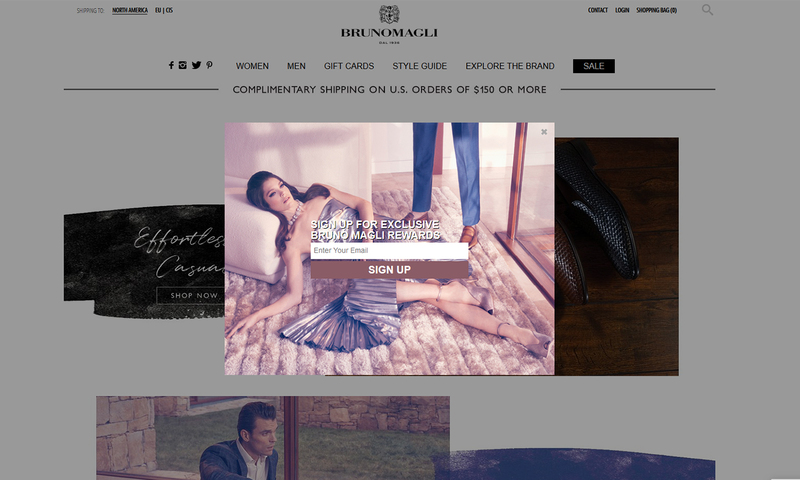 Yet its stripped-down design makes it look as if it is only asking for your email address. Let’s switch to grey and black. This pop-up’s subtle design and position make it visible but not annoying. I can tell you from experience that this balance is difficult to reach. This lightbox’s variant includes a glow which makes it more impactful. Simple and efficient. This pop-up is a delight for the eye. But it’s also very smart to invite visitors to “join the club.” You’re not only sharing your email address, you’re entering a private group which will unlock exclusive benefits. Lovely visual, excellent choice of colors and a short copy that says just enough about the reward for new subscribers. 10/10! Tigerlily Swimwear’s website is colorful. 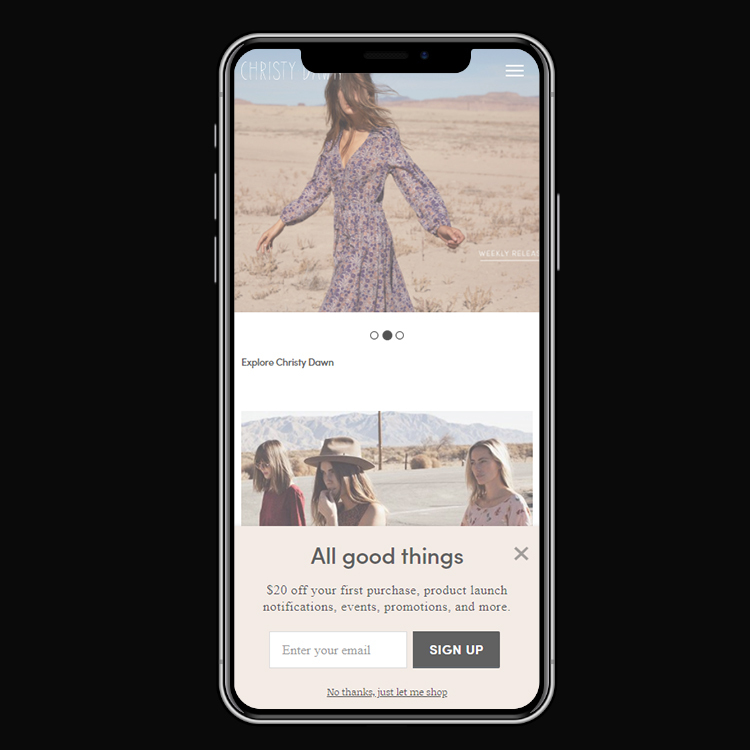 Picking a black and white visual is a good choice: it helps users to pause and consider the form and its offer. 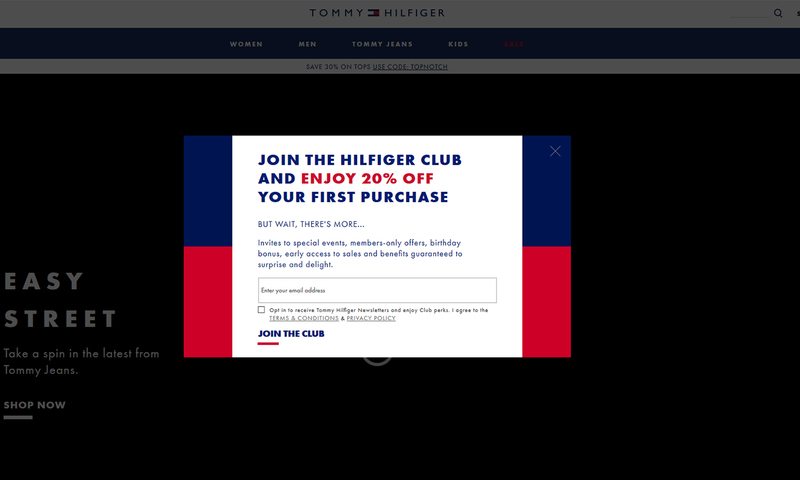 Yes, this opt-in pop-up includes a lot of fields. But its positive visual and clean structure convinced us to include it in this selection. This unusual shape catches visitors’ attention instantly and introduces a positive vibe. 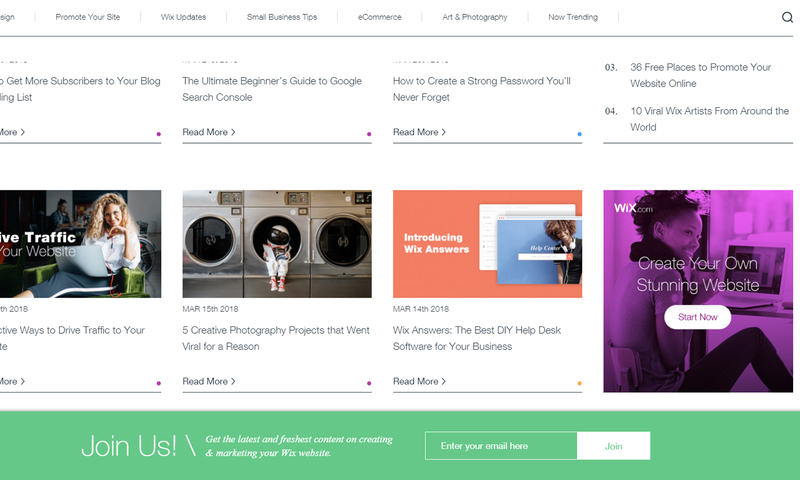 The classic “Stay in the know” is powerful as well: nothing works better than suggesting that your visitors might be missing out on something. 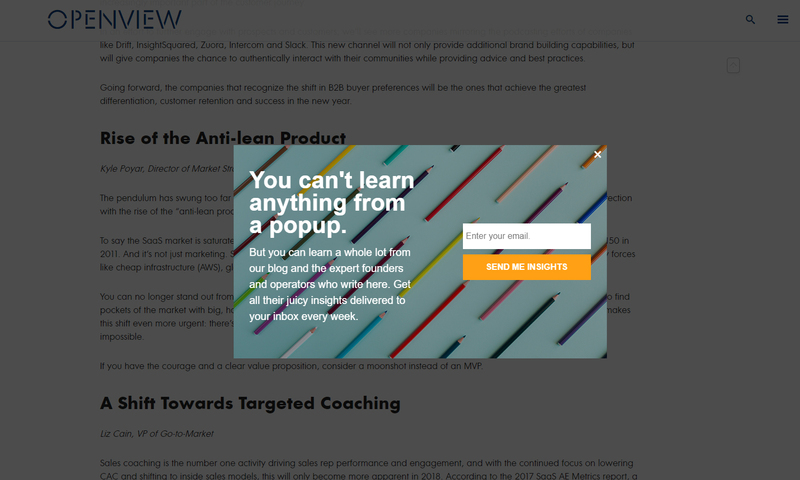 Until now, we’ve focused on pop-ups centered on the user’s screen. Some marketers are getting off the beaten track and trying new positions. 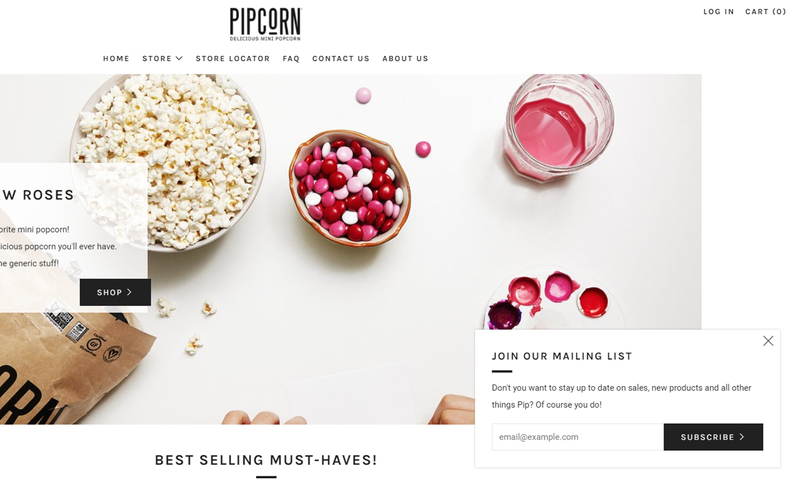 Pipcorn, for example, is positioning their pop-up on the right. They’re probably assuming that users tend to scan their page in a Z shape. Believers of this UX theory consider that the bottom right corner of the screen is most likely to drive action. This one from Over The Rainbow follows the F pattern theory. 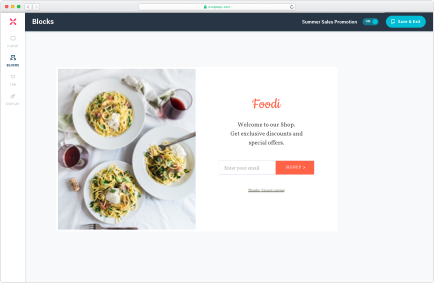 According to research by Instapage, placing your call-to-action at the bottom left of the page is the best way to drive conversions. After lightbox pop-ups and side pop-ups, it’s time to check some email bars! This one from Ulta ranks high on my personal list. Bright colors, eye-catching call-to-action, excellent position — you can’t beat it! The reward is clearly stated (who could miss the $5 OFF offer on this form?) and the position is ideal for users; they can browse and easily access the different menus and call-to-actions on the page. 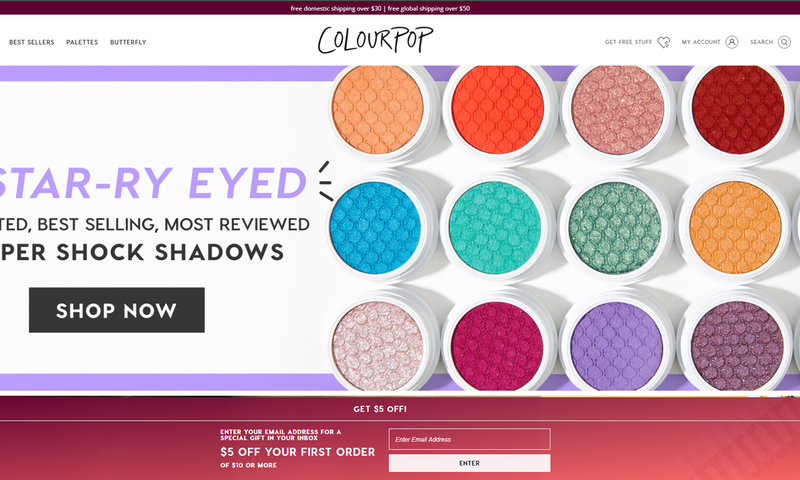 Using a gradient helps raise users’ attention and aligns with ColourPop’s brand mission. Sure, e-commerce pop-ups are interesting. But it’s worth reviewing some B2B examples as well! Let’s start with a classic lead magnet. 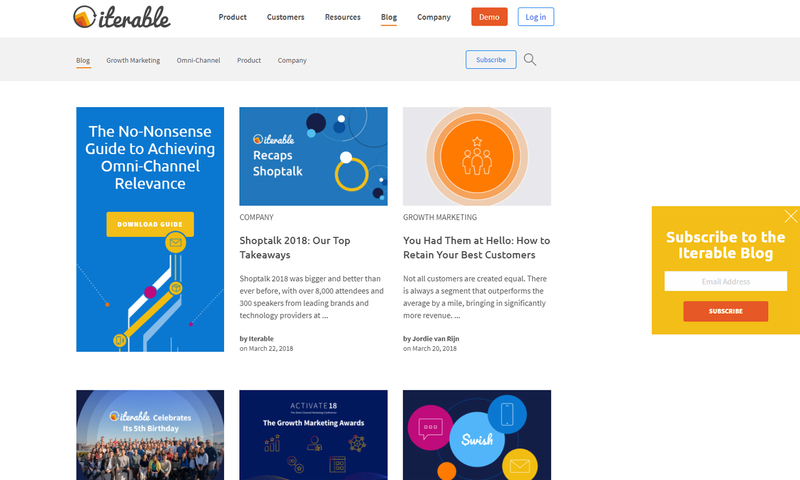 Sitepoint offers new subscribers a free book. This email capture form is simple. But its copy is very strong. 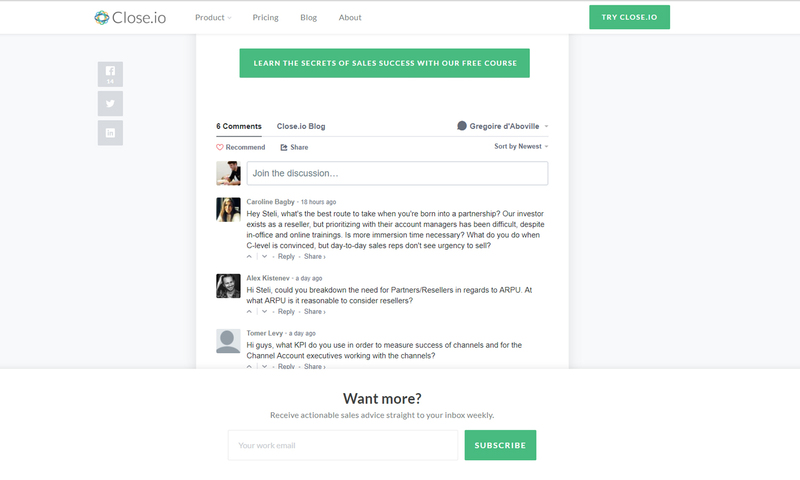 Gong’s team relied on two declinations of the same marketing technique: social proof. In the headline, they suggest that a lot of users have already joined the list (Wisdom of the crowd effect) while the body relies on Expert social proof. Who wouldn’t like to join employees from Linkedin and SalesLoft? There’s a lot to say about this one. The choice of colors is clever. Red is used to highlight two key elements: the number of trends (suggesting that the document is valuable) and the final call-to-action. The other secondary elements are in grey and black. The wording is especially creative. “Unlock” and “I’m not interested” are particularly strong. Note that they also confirm that the book is free to counter potential objections. 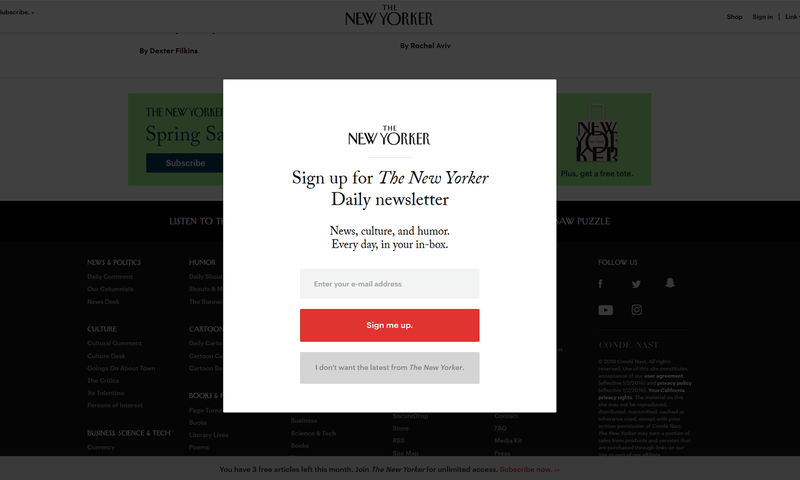 Trust me, when preparing this selection, we reviewed thousands of newsletter pop-ups. We haven’t found one with a stronger headline. True and engaging! 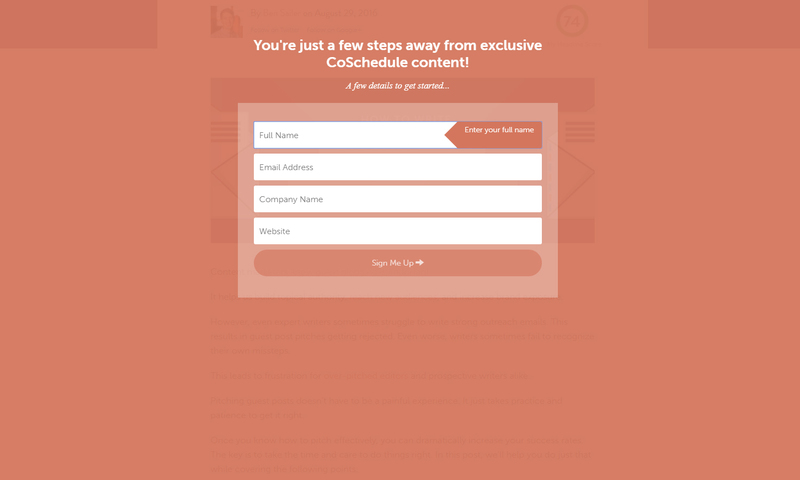 CoSchedule has an excellent reputation in the content marketing community. Turns out content is not their only asset. 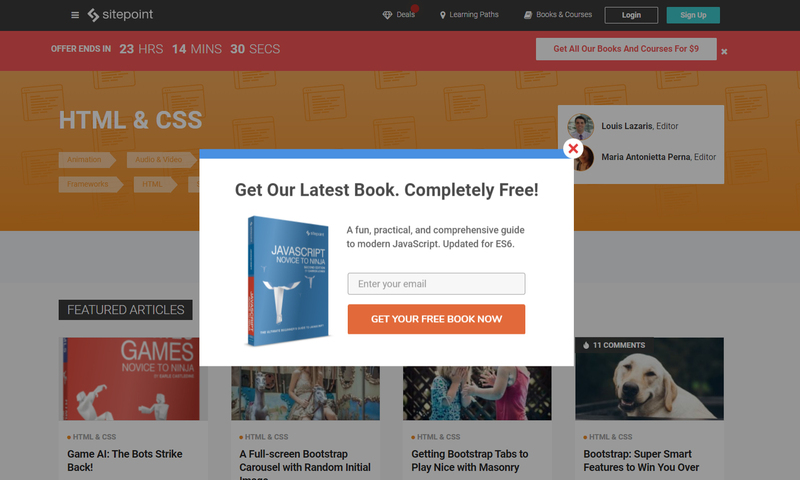 This interactive pop-up displayed when visitors are exiting the page is very convincing as well. This email capture campaign from Chanty is simply stunning. Using animation in a pop-up is already a great idea. But using a Matrix-inspired animation looks too good to be true. One of the most creative campaigns we’ve seen, hands down. 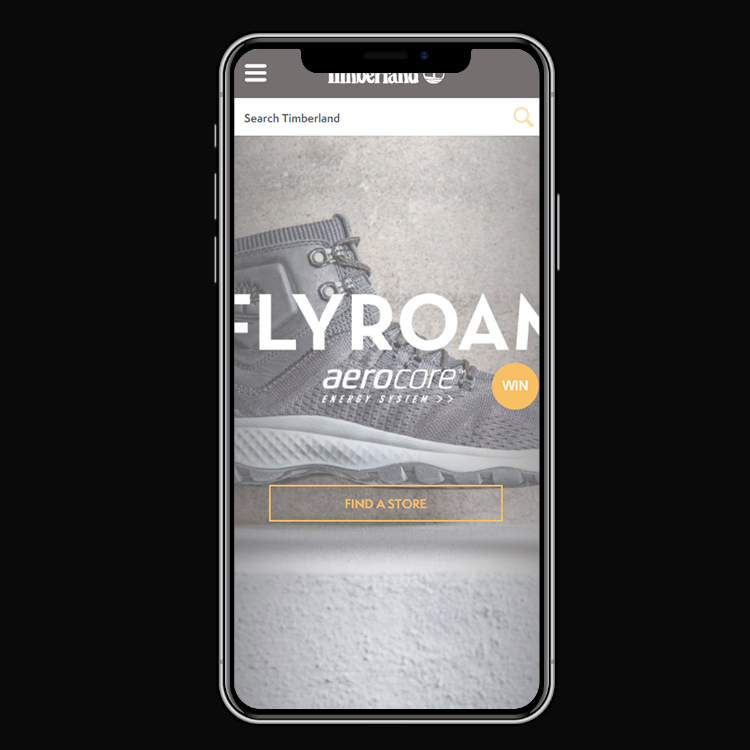 When you don’t want to interrupt your visitors during their navigation, your best option is a smaller pop-up displayed on the side or at the bottom of the page. Most B2B blogs use this format and position to capture emails while letting visitors enjoy the content of the blog. This one from Iterable’s blog is no exception. This one comes from Mailgun’s blog. 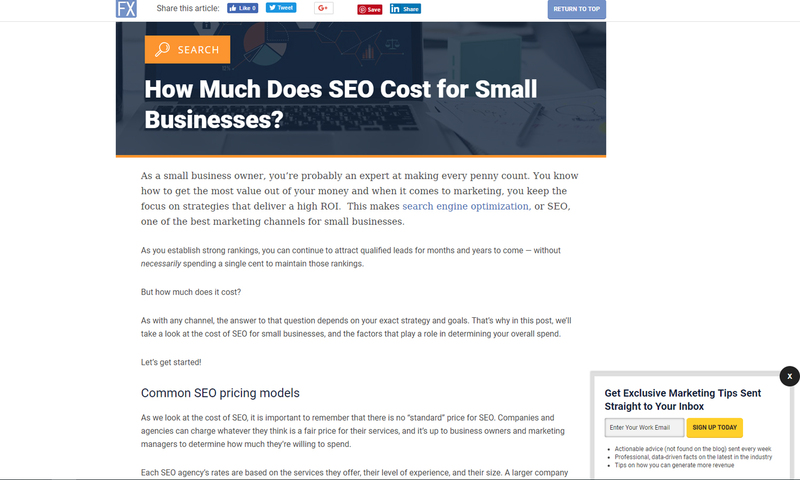 Again, the setup is subtle: the pop-up appears as you scroll and stays in an empty corner –in other words, you can still read your article comfortably. 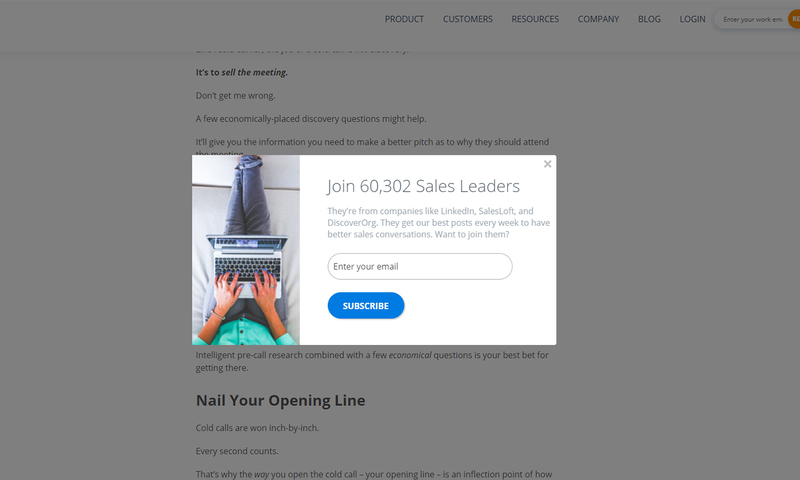 Same kind of creative for this pop-up from WebPageFX. 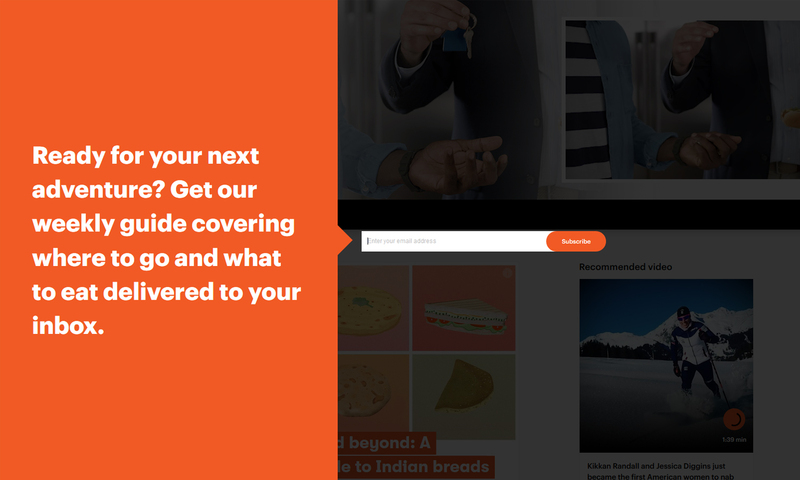 But its border and colorful call-to-action make it catchier. They also listed some very convincing benefits (you’ll note how they play on the exclusivity). 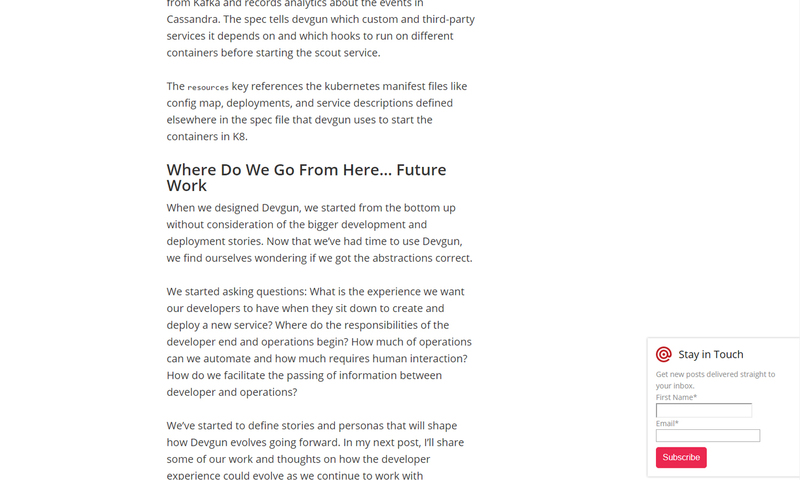 I stumbled upon this one on close.io’s blog. 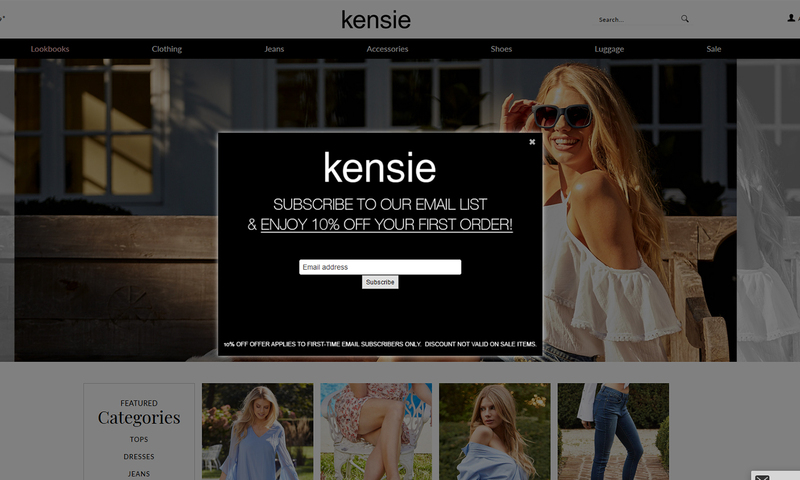 As they use an email bar, the content is still accessible, and yet the invitation to subscribe is very visible. Nicely done. 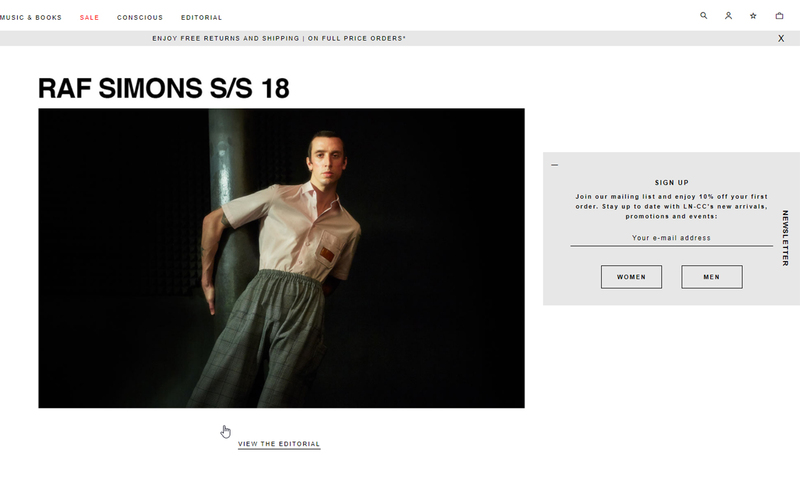 Taken from Wix’s blog, this campaign is also an email bar. But it goes a step further with contrasting colors which make the bar unmissable. Built using a three-column layout, it’s also easier to read. 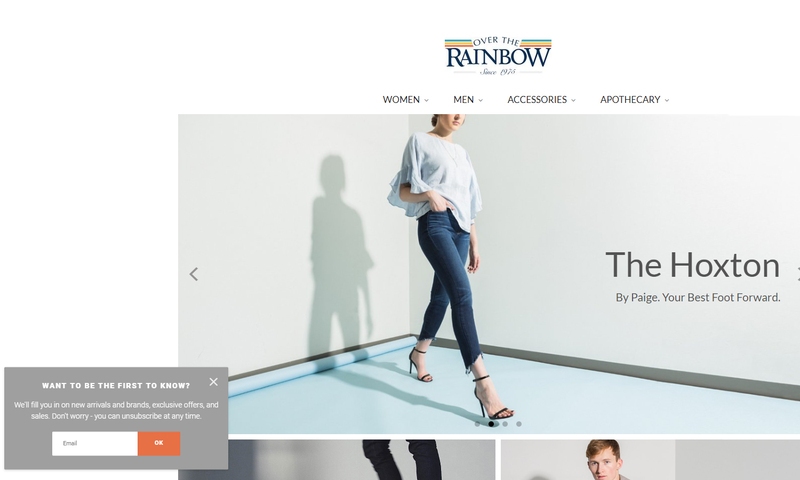 After reviewing B2B and e-commerce pop-ups, I wanted to include some examples taken from media websites. Why? 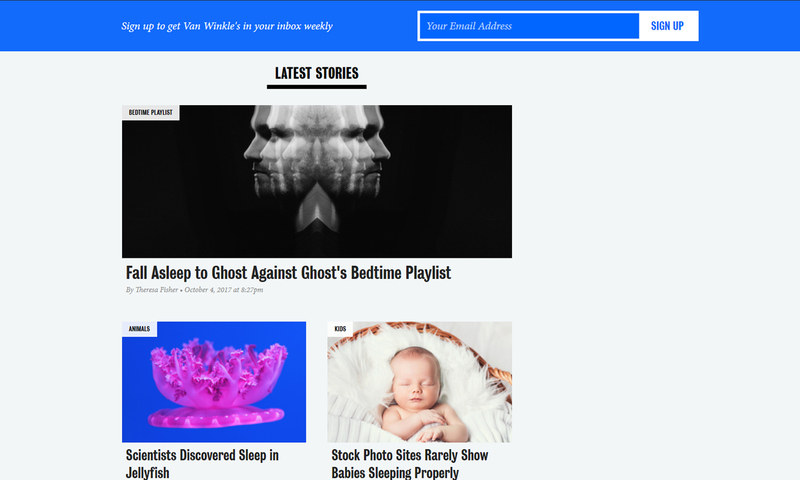 Because most media rely heavily on newsletters to drive traffic. They desperately need to collect emails to survive. As a result, campaigns in this industry are often very creative. Let’s start with one of the most respected newspapers –the New Yorker. Their design is sober and straight-to-the-point: no visual, no fancy illustration. 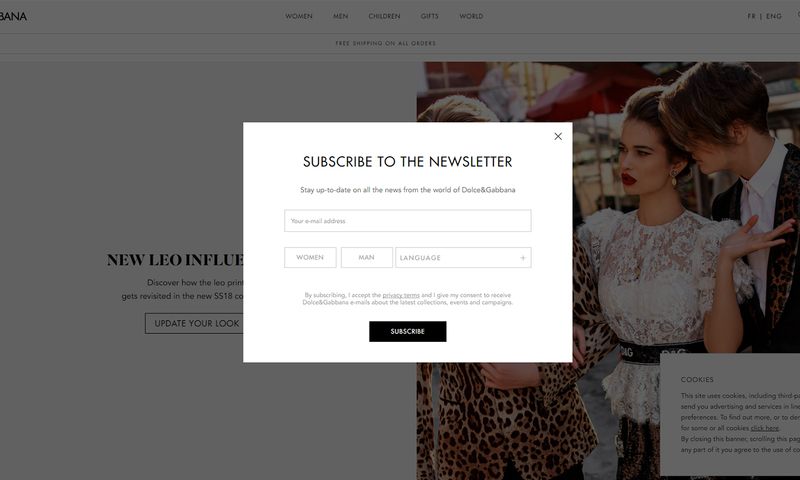 The only colored element is the call-to-action, to drive users to subscribe. The dismiss button is much less enticing. This one was taken on mic.com. 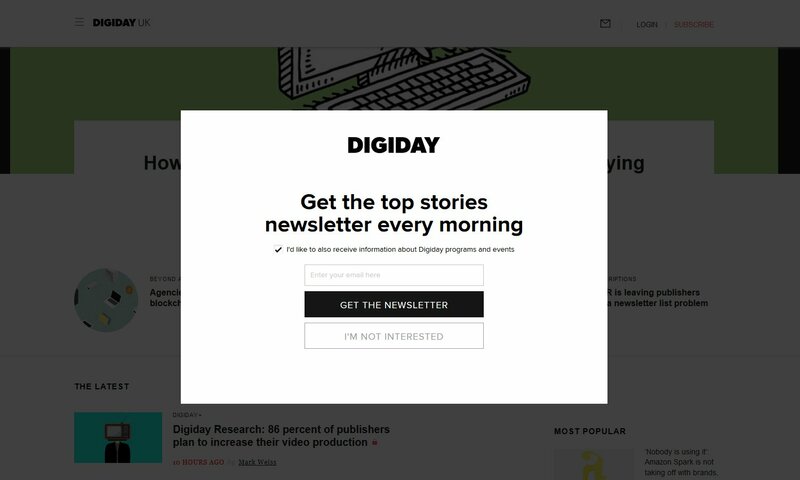 Their targeting strategy is very interesting: the pop-up varies, depending on the page you’re reading. I saw this one when I was about to leave an article about food. The full screen design is also both good-looking (and a bit impressive) and eye-catching. Yet another black and white pop-up. The headline is catchy and simple. 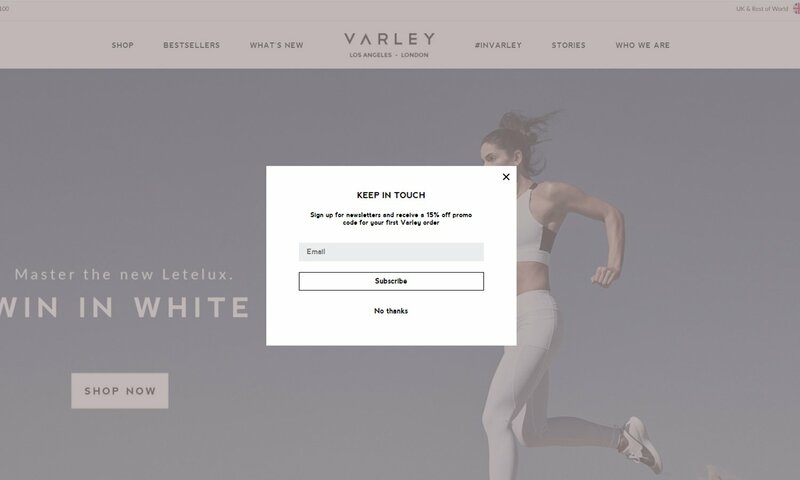 Yet the call-to-actions, especially “I’m not interested,” make visitors think twice before they close the modal. They also feature their logo to insist that the pop-up is not an ad. The picture of Jordie, the webmaster, which establishes trust. Do you think a spammer would share his picture? Here, we have the combination of an unusual shape (rounded pop-up), bright colors that catch the eye and a cool headline. Again, the pop-up features the media’s logo to distinguish the pop-up from an ad. 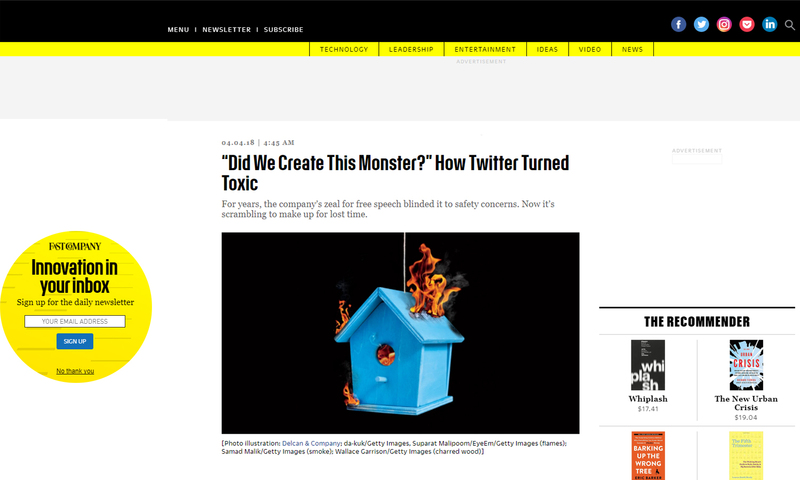 Take FastCompany’s email form and add a lead magnet. Boom! You get PEC’s pop-up. The lead magnet looks very relevant for their audience, mainly interested in learning more about e-commerce. Why did this email bar make it to our selection? First, because of its catchy colors. And then, because they chose to place it at the top of the screen, which is quite original. RGE’s headline is honest and fun. Not sure if it would work for a different audience. If the headline is funny, the sub-heading is more classic and states the benefits of signing up. 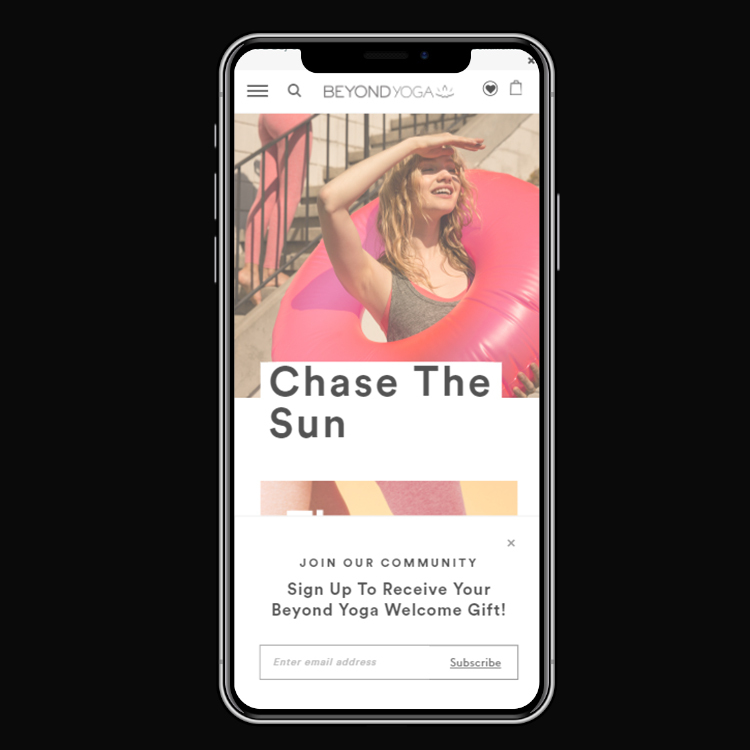 The call-to-action is in the same tone as the headline and invites visitors to take the email subscription process easy. 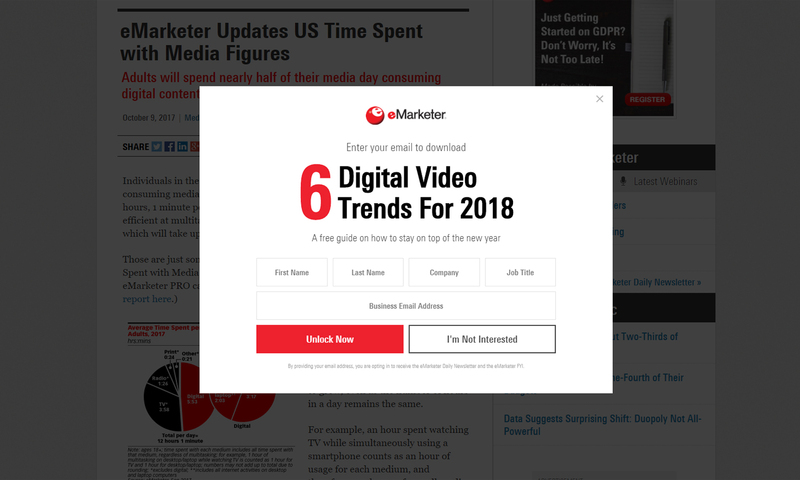 Now let’s finish with 2018’s hottest email marketing topic: mobile pop-ups. 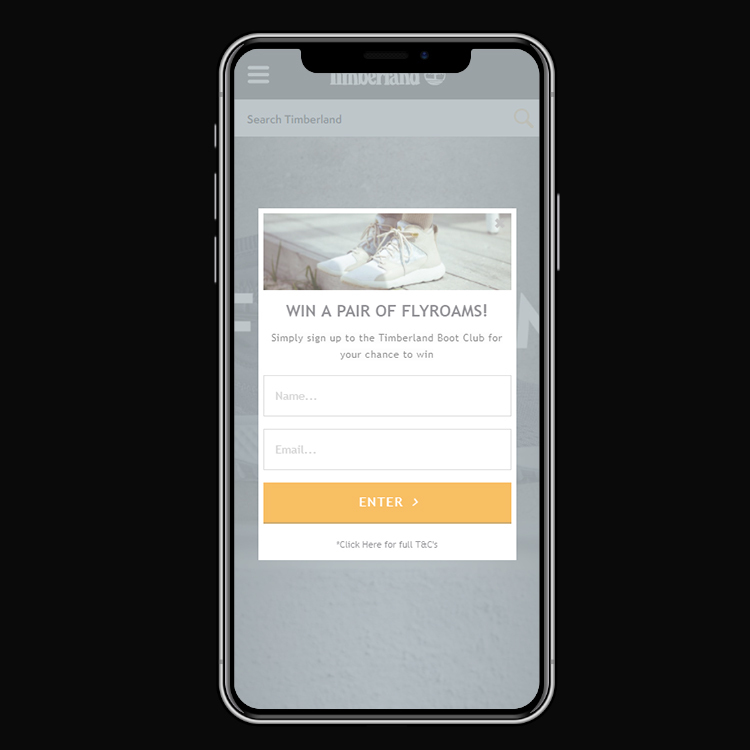 If you want to create your own, we recommend you check our best practices for mobile pop-ups article. But first, let’s get you inspired. ST’s campaign is funny and displays super well on mobile phones. The best part? It’s responsive. If you visit their desktop website, you’ll get the same pop-up. Well done! Using the term “community” gives value to the subscription process. The wording plays on surprise. It mentions a gift without saying anything else about it. It’s cheap and according to research, it’s super efficient. This one from Christy Dawn makes the most of the limited space that’s available. Did you see how they listed all the benefits? Looks like everything is included. The colors are also great: eye-catching but not too flashy. 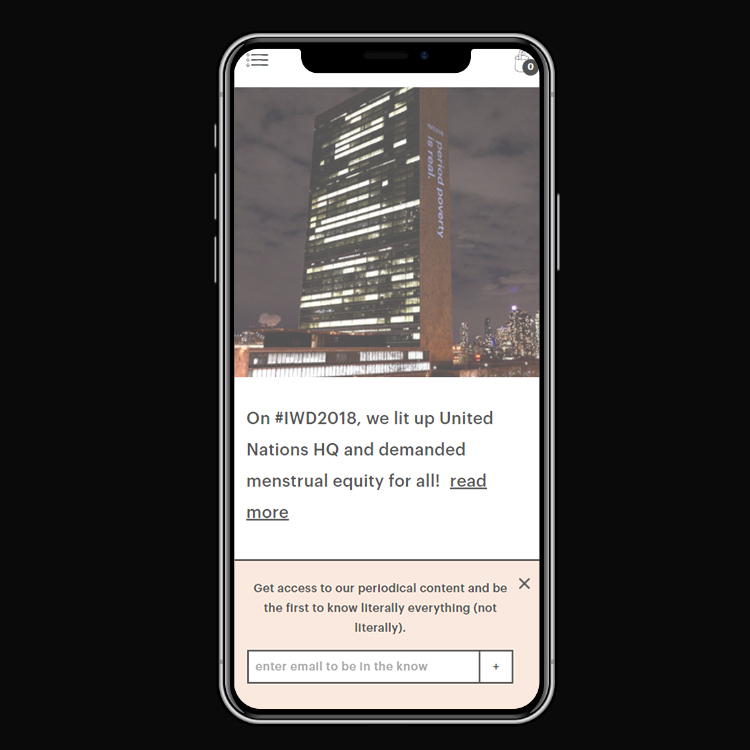 Finally, they took into account the users who might want to close the pop-up: the campaign features two closing options that are easy to click. This selection would be incomplete without a call-to-action pop-up. This one comes from Timberland Australia. 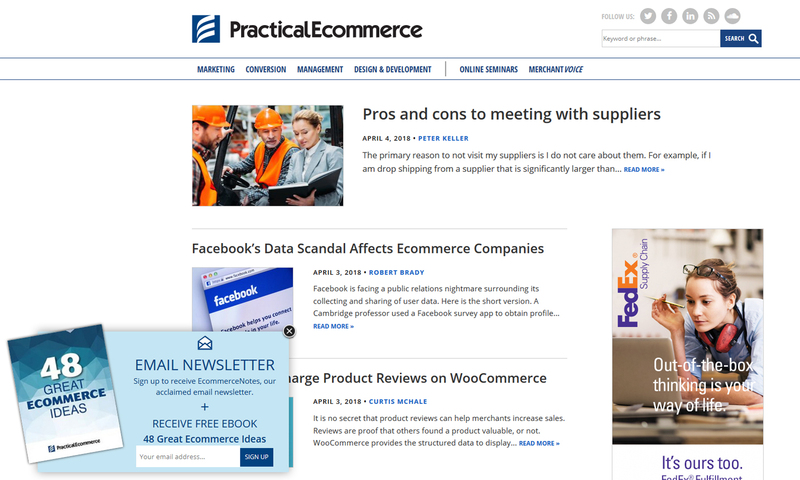 They display a tempting “Win” call-to-action. When the user clicks, the full message is displayed. A smart way to play on visitors’ curiosity. Wow, I can’t believe we’re done already.